The Editorial Staff, the Editorial Council and the Editor-in-Chief of the Journal of Russian Law in their activities are guided by the Ethical Guidelines to Publication of Research, designed on the basis of recommendations of the Committee on Publication Ethics, and demand from each party of publishing process to follow the mentioned Guidelines. 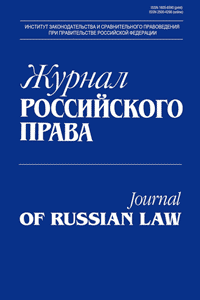 The Editorial Staff, the Editorial Council and the Editor-in-Chief of the Journal of Russian Law should take responsibility for publishing authors’ materials. Peer-review process in the Journal of Russian Law is anonymous and is carried out by experts in subject matter domain of manuscript submitted on the basis of the Regulations on reviewing of articles.